Unity is a cross-platform 2D and 3D game development system developed by a company called Unity Technologies (originally named Over the Edge). What does it mean to call Unity cross-platform, exactly? Well, it’s cross-platform in the sense that the Unity Editor, the game creation and editing tool that is the centerpiece of Unity, runs on macOS and Windows. More impressively, Unity is cross-platform in the sense that using the Unity Editor you can build games for macOS, Windows, web browsers (using Flash, Google Native Client, or Unity’s browser plug-in), iOS, Android, and game consoles. And the list keeps growing. As for 3D, Unity is a 3D game development system in the sense that Unity’s built-in graphics, sound, and physics engines all operate in 3D space, which is perfect for creating 3D games. Unity can also be used to create 2D games; in fact, many successful 2D games have been developed in Unity. This book describes the latest version of Unity as of this writing, which is Unity 5.6.2, but Unity is a fast-moving target, with new features and user interface changes appearing even in minor releases. This caveat applies to everything, of course, including products, licenses, and prices from Unity, Apple, and third-party vendors. Before the fun part, which includes learning how to use the Unity Editor and build games, you need to download Unity and install it. 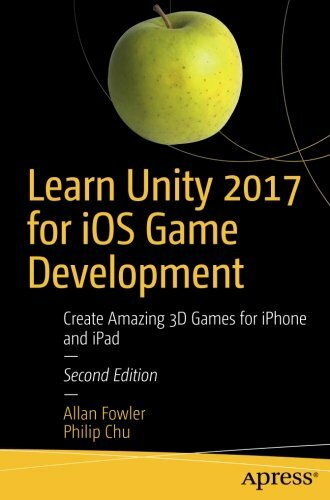 Although you’ll spend the first several chapters working with step-by-step examples in the Unity Editor and not get into iOS development until later (by the way, iOS originally stood for iPhone Operating System but now includes the iPod touch and iPad), it’s not a bad idea to get started on the iOS development prerequisites, too. For iOS development, you’ll need a Mac running the Lion or Mountain Lion version of macOS (10.9.4 version and Xcode 7.0 or higher). Unity 5 can still run on some older versions of macOS, like Snow Leopard, but Lion and Mountain Lion will need the latest version of Xcode, the software tool required by Apple for iOS development. Typically, the latest or a fairly recent version of Xcode is required to target the latest version of iOS.